Ostracism didn’t put down Narthaki’s determination or talent. Padma Shri Dr Narthaki Nataraj – every single word in her name smells of blood, toil, tears and sweat. 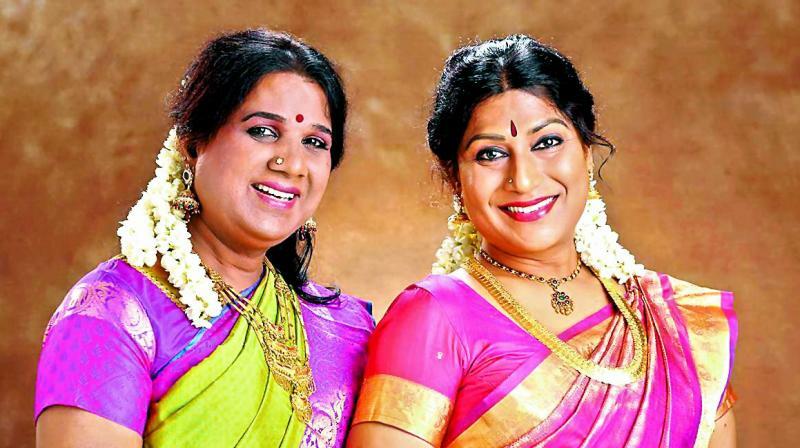 The first transgender artiste to be honoured with Padma Shri, the fourth highest civilian award in the country, Narthaki looks back at her journey through rejections, bravery, hatred, insults, perseverance and success. Born and brought up in the rustic charm of Madurai in Tamil Nadu, Narthaki grew up among her 10 siblings, enjoying the love and warmth of a joint family. When she started experiencing the bliss of feminineness growing inside her male body, she couldn’t express it to anyone. She terms it ‘a beautiful feeling’. In the 80s and 90s, when society wasn’t open to gender diversity, when society decides for each person – what one should be, what one should wish for and if one should laugh at all, Narthaki soon became an outcast. Her only solace in the loneliness was the enlightenment of the feminineness and the dancer in her. “We didn’t know anything about Bharatanatyam or dance other than film songs. Our introduction to dance was through the spectacular idols of the Madurai Meenakshi Temple, the Nataraja deity and actors like Padmini, Vyjayanthimala and Kumari Kamala,” she says. The pronoun she uses initially surprises one; why ‘we’? Because it has always been ‘we’ — the inseparable Narthaki and Sakthi. Sakthi aka Sakthi Bhaskar has been Narthaki’s soulmate; they are friends from childhood. She clearly remembers that most precious moment of her life — the day they met. Alone, chased away by family and other children in the neighbourhood, Narthaki was sitting alone when she spotted another person like her — another outcast for her sexual identity. “I asked if we could play together then. We created a world for ourselves where we would happily play and dance; we have carried that world with us to this day. Sakthi is my friend, mother, guru and philosopher. I am her only world; there’s nothing beyond me for her. Whatever I am today is because of her sacrifice,” says Narthaki. Ostracism didn’t put down Narthaki’s determination or talent. A formal training was near-to-impossible at that time, but the universe conspires in strange ways. Says Narthaki, “It wasn’t me who found my guru, but my good fortune and destiny. My first teacher was Namanur Jeyaraman from the Thanjavur bani. We travelled all the way to Sivaganga to meet him. I was about 12. At the hallowed halls of his house, I saw the photos of Kamal Haasan’s sisters who had learnt dance from him. But Guru Jeyaraman was extremely ill and asked me to pray to Goddess Meenakshi for his recovery. A month later, I got a card from him to get a space ready for classes in Madurai. In the one year that followed, I learnt a full margam and got ready for my arangetram in 1983. My guru died a month later. It was as if God had kept him alive for a year just to teach me and conduct my arangetram. I started giving Bharatanatyam recitals after that,” she recalls. Destiny had more wonders in store. When Narthaki and Shakthi danced at festivals and won prizes, to whoever who asked who their guru was, they said they would get trained under Vyjayanthimala’s guru! They didn’t even know who it was. Only later, from a magazine, did the duo come to know that it was K.P. Kittappa Pillai and that he was at Thanjavur. “We rushed off to Thanjavur to become his disciples. It was easier said than done. He would ask us to attend Vyjayanthimala’s recital in Bengaluru or Sudharani’s recital in Chennai and on seeing us there, he would wonder why we were there! It was hard on us financially, but we persisted relentlessly for nearly a year and miraculously, one day he announced, Come tomorrow. We will start class. We rushed back to Madurai and returned the next day with flowers and fruits as guru dakshina,” she says. After training under Kittappa Pillai, a direct descendant of the famous Thanjavur Quartet brothers, the fathers of Bharatanatyam, Narthaki started giving recitals, propagating and preserving the Thanjavur style Nayaki Bhava tradition and rare compositions practised in ancient Tamil temples, which earned her name and fame. “Our friends asked us to move to Chennai to perform and continue our work of spreading the tradition of Thanjavur Quartet and compositions based on Sangam and Bhakthi (mystic) era literature. Chennai was a different world and honestly, we didn’t like it much. The city is where I earned fame and laurels, but my heart still lies in my Madurai village. I haven’t forgotten my roots and that, I believe, attributes to my success,” she adds. Sakthi has been with Narthaki through the ups and downs, often shuttling between the roles of her makeup assistant, programme coordinator, compère and occasionally, a co-performer. A strict disciplinarian, Sakthi also manages the training sessions for students. Narthaki stresses how fortunate she has been. “Every transgender person yearns for love. We never want to leave our home, but we are forced out. When thrown out, we have no options to survive. But I was very lucky that I had Sakthi by my side. Like the Tamil saying Tell me about your friend, I’ll tell you about yourself”. While dancing, Narthaki enters a trance, so does her audience. “I get elevated to a different level, forget myself and perform. People have told me that they have had divine experiences while I dance, but I don’t do anything special; it’s just the energy at that moment that passes on to everyone around,” she adds. Now, the life story of Narthaki is included in the textbook of Tamil state syllabus. “Schools are where revolution begins. We couldn’t go to school or college, but now, learning about us, students would be kinder and encouraging towards their friends whom they find are different,” she hopes.